To ensure complete safety around your dock and parking areas, PVCStrip.com offers a complete line of parking blocks and speed bumps. Safety items such as parking blocks, speed bumps, column protectors, dock bumpers and dock lights will not only increase work safety but will also lessen the chance of damage to your facility and its inventory. Parking blocks are made of high-density polyethylene (HDPE), which is lightweight and extremely durable. A single HDPE parking block only weighs 15 pounds but will last for years. While strong enough to handle the heaviest loads, HDPE parking blocks are flexible enough to fit varying contours. 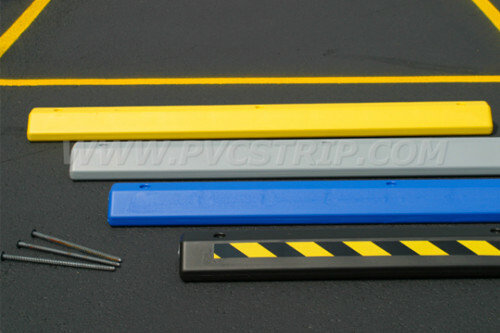 PVCStrip.com’s parking HPDE blocks are UV and chemical resistant and come in a variety of colors. Solid plastic parking blocks are virtually indestructible and come with a lifetime warranty against breakage, chipping and cracking. Anchors are included with each parking block. Speed bumps available through PVCStrip.com are designed to handle the heaviest loads. Made from high-density polyethylene, bumps are tested to 20,000 pounds per pneumatic tire. With channeled groves in the bottoms, the bumps can also serve as a cable guard. All PVCStrip.com bumps have non-skid surfaces and are extremely durable. Similar to the parking blocks, speed bumps are UV and weather resistant. For more information on traffic control products, please call 888-303-8515 or contact us.